… Well, it sort of did and didn’t. Atkinson raised two major theoretical points in his paper. The first, and the one I’m interested in, made the link between phoneme inventory sizes, mechanisms of cultural transmission and the underlying demographic processes supporting these changes. Sadly, it was Atkinson’s second idea – that we could develop a serial founder effect model from Africa based on the phoneme inventory size – where most of the attention fell. In a methodological sense, I admired Atkinson’s approach to testing this second hypothesis, but I did feel he jumped the gun somewhat: I think more work was needed on the cultural transmission model before testing for serial founder effects. Indeed, that we haven’t developed an initial model linking the relationship between phoneme inventory size and demography, may yet prove to be Atkinson’s downfall: we should be testing multiple explanatory models (Bayesian MCMC comparison, perhaps?) rather than taking a one-size-fits-all approach. Anyway, my long-winded and whiny intro of lost opportunities aside, the reason for this post is that Linguistic Typology has recently published a series of papers on what were probably the two big headline hitters of last year (at least in evolutionary linguistic circles): the aforementioned Phonemic Diversity paper (see here and here) and Dunn et al’s Word Order Universals paper (see here, here and here). In fact, the latter paper is a perfect example of the point I was trying to make above: they tested multiple, competing hypotheses to explain the same set of data. I’m hoping someone else will pick up on the Word Order commentary (and that includes anyone outside the usual contributors, so here’s my email), because I’m not sure whether I’d do the topic justice. Over the coming weeks, however, I will dedicate several posts to the great vanishing phoneme debate, with each post gradually laying out my theoretical model for linking cultural transmission and socio-demographic forces with the size of a language’s phoneme inventory. Joan Bybee: How plausible is the hypothesis that population size and dispersal are related to phoneme inventory size? Introducing and commenting on a debate. Peter Trudgill: Social Structure and phoneme inventories. 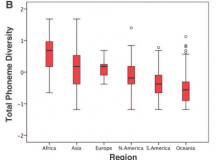 Mark Donohue and Johanna Nichols: Does phoneme inventory size correlate with population size? Ӧsten Dahl: Are small languages more or less complex than big ones? Søren Wichmann, Taraka Rama, Eric W. Holman: Phonological diversity, word length, and population sizes across languages: The ASJP evidence. Richard Sproat: Phonemic diversity and the Out-of-Africa theory. Claire Bowern: Out of Africa? The logic of Phoneme Inventories and Founder Effects. Vladimir Pericliev: On phonemic diversity and the origin of language in Africa. Don Ringe: A pilot study for an investigation into Atkinson’s hypothesis. Keren Rice: Athabaskan languages and serial founder effects. Bill Ross and Mark Donohue: The many origins of diversity and complexity in phonology. Ian Maddieson, Tanmoy Bhattacharya, Eric D. Smith and William Croft: Geographical distribution of phonological complexity. Florian T. Jaeger, Peter Graff, William Croft and Daniel Pontillo: Mixed effect models for genetic and areal dependencies in linguistic typology. Quentin D. Atkinson: Linking spatial patterns of language variation to ancient demography and population migrations. I’ll hopefully mention some of these in the coming weeks, but I’ve only got limited access to them (apparently, even institutional access is not enough to bypass the gated walls of this archaic system of distributing knowledge). It’s “Claire Bowern”, not “Bower”. The Keren Rice paper, exploring a well developed linguistically, but still prehistoric example looks particularly interesting. Previous Previous post: Beware the Raconteur, my son!